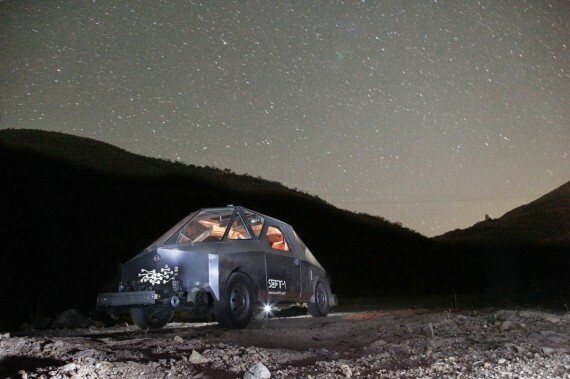 "We started by building a spacecraft," begin Ivan Puig and Andrés Padilla Domene, brothers and artists based in Mexico. 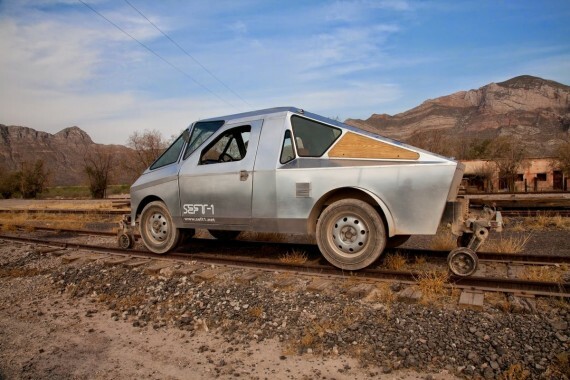 They dubbed the hulking aluminum beast, which resembles a stage prop as much as a working vehicle, SEFT-1. The retro-futuristic spaceship, appearing both vintage and futuristic, is only part of the brothers' artistic adventure. They're using the uncanny vessel to explore the train tracks connecting Mexico City to the Atlantic Ocean -- tracks that have been abandoned for almost 20 years. The railroad is the result of a partnership between British companies and the Mexican government, aimed to connect Mexico and Europe by way of the Atlantic Ocean. Yet as time went on the decision was deemed unprofitable and in 1995 the railway was privatized. As a result, the 9,000 kilometers (5,600 miles) of rails, as well as the rural communities surrounding them, were left stranded to rot. The neglected lands were surrendered in a sort of limbo, trapped in a not-too distant past and slowly creeping towards isolation and decay. That's where Ivan and Andrés come in. From 2010 to 2012, the brothers, who call themselves "Los Ferronautas," have explored the rejected badlands of Mexico and Ecuador, recording the people and spaces they encountered along the way through a series of maps, images and interviews. "Abandoned tracks are very mysterious because they are lines going to an unknown place," the brothers explain in a BBC video. "There is nostalgia at the same time, but there is as well some excitement at rediscovering a place." This unusual cohabitation of excitement for the unknown and nostalgia for the well-known stems from the equally strange phenomenon of the modern ruin, a space as strangely desolate as it is familiar. The abandoned railways, like the spacecraft navigating them, suggest a dystopian future, where an industrial system breaks down and nature returns to its wild reign. "In Mexico as in Britain, there are plenty of ancient ruins to inspire wonder," Jonathan Jones explains in The Guardian. "When we look at modern ruins we get a different feeling. We are amazed by the stupendous waste and wreckage of industrial economies." Jones continues to express that, in fact, modern ruins aren't only to be found on surreal retro-futuristic space voyages. They're everywhere. "Look again at that derelict space below the overpass, that wasteland by the industrial estate. Even building sites are ruins in reverse, film footage run backwards of a city falling down." Meditate on that next time you pass a metallic trash heap on your morning commute. "SEFT-1 Abandoned Railways Exploration Probe: Modern Ruins 1:220" runs until July 22, 2014 at Furtherfield Gallery in London.